In accordance with our curriculum, we like to base explorations upon our students’ interests. Doing so allows students to take ownership of their learning experience and motivates them to dive deeper into, and better grasp, concepts. In our classroom, it is very common for the students to circle tables or shelves with Legos and blocks, pretending that the materials are vehicles. The type of vehicle changes with every loop and turn. To further this interest, we placed a large sheet of paper on the table and attached skinny Crayola markers to edges of the large blocks. Rather than circling the table with the blocks, the children chose to sit down and watch carefully as their movements made “tracks.” While making their tracks, the students used very large motions on the paper. Some even stretched themselves to the other side of the table. Later that afternoon, we provided the students with small individual sheets of paper and attached the skinny makers to smaller, narrower blocks. Using smaller materials on smaller paper forced the children to use smaller movements and gestures to make their tracks. 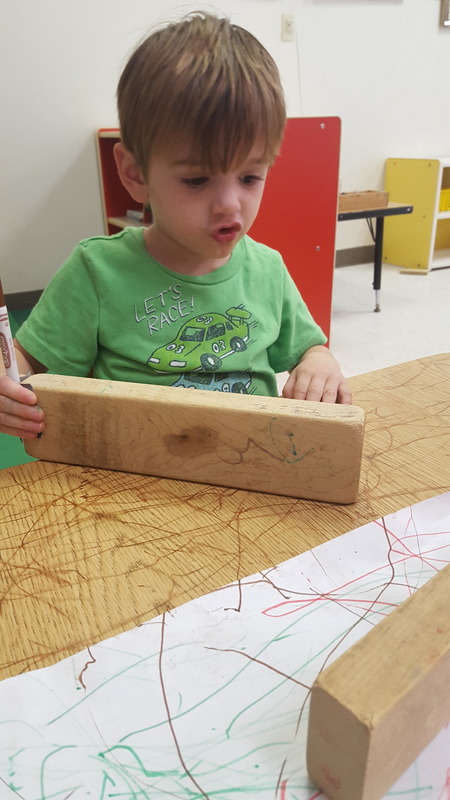 This entire experience incorporated two primary aspects of learning and development- dramatic play and fine motor skill development. 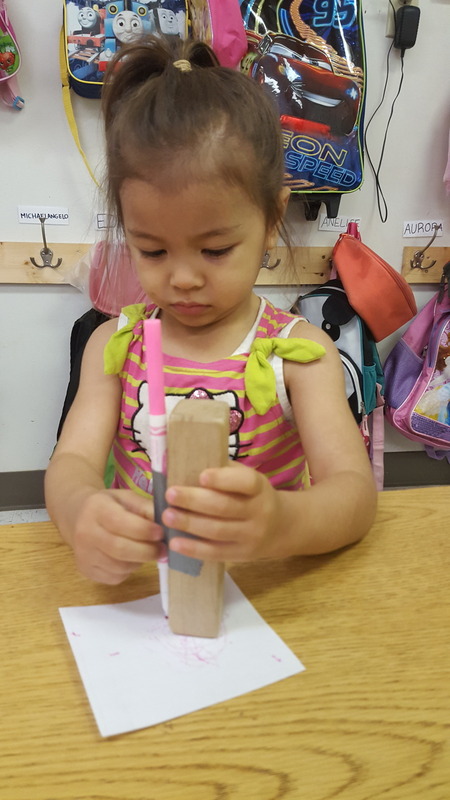 Blocks are an open-ended material, or a “blank canvas” of a play material, coming to life as children apply their imagination and creativity. 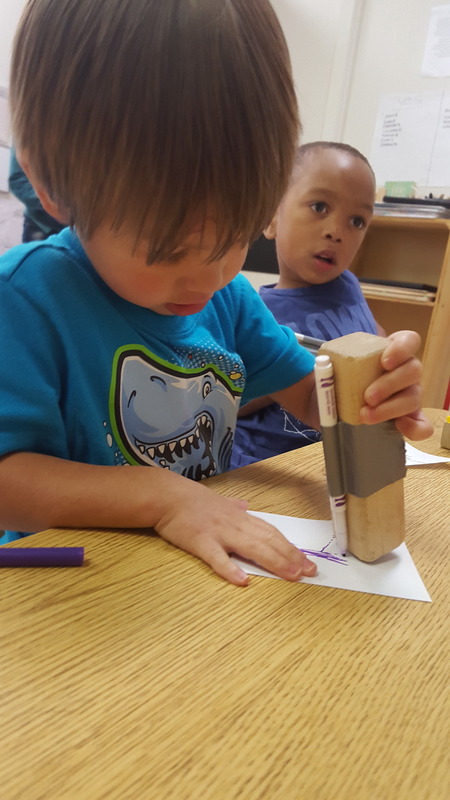 In pretending that the blocks are vehicles, and that the marks left behind are tracks, the children show an understanding of mental representation and symbolism. Not only is this a fun form of self-expression, but it also encourages creativity and serves as a milestone in cognitive development. 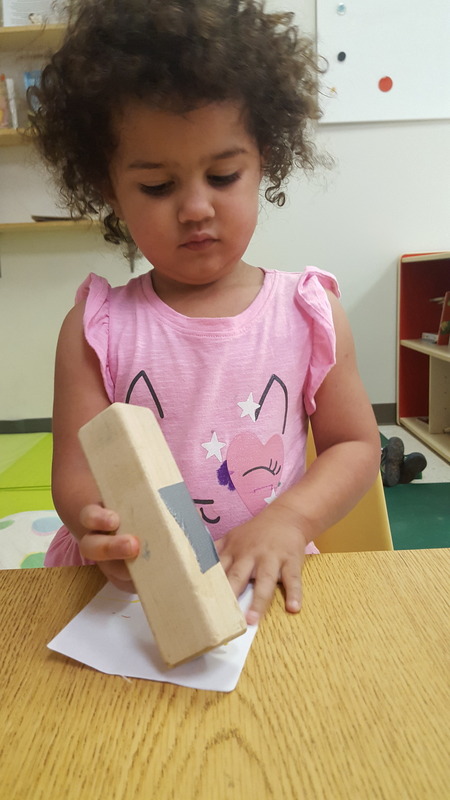 Fine motor skills deal with the level of strength and control a child has regarding their finger, hand and arm movements. By grasping, reaching and operating different tools, children build the muscles in their hands and arms and enhance their fine motor skills. In this exploration, the incorporation of different block sizes provided an assortment of fine motor challenges for the students. With the larger blocks, the children practiced using their reach and stretch to make tracks. When using the smaller blocks, the children’s strokes were slower and more controlled. Each required a different set of muscles and a different level of focus and attention to detail.